The Vinh Tan 1 thermal power plant’s second turbine is now in the stage of trial run and is expected to start commercial operation by the end of this year, six months ahead of schedule. 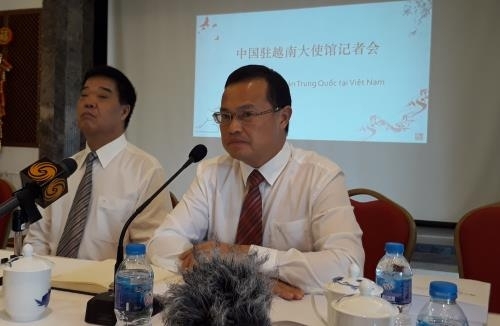 The information was unveiled by Chen Lian Qing, Deputy General Director of China Southern Power Grid (CSG) – one of the project’s three investors - during a press conference held by the Chinese Embassy in Hanoi on July 26. Chen said that the first turbine was put into operation on July 6, meeting the rising demand for power in Vietnam and helping deal with the country’s power shortage. Currently, the first turbine is running stably, generating a total of 700 GWh so far, he said. Chen confirmed that the company will strictly abide by Vietnam’s law, particularly its regulations related to environmental protection. According to Chen, thanks to the application of modern technology, the plant has met all environmental criteria of Vietnam. The project was launched in July 2015 in the central province of Binh Thuan. Of the project’s total cost of US$1.75 billion, Chinese investors contributed 95 percent. This is the first build-operate-transfer (BOT) project invested by Chinese enterprises in Vietnam. It comprises two turbines with a capacity of 620MW each, using pulverised coal combustion technology. The plant will be handed over to the Government of Vietnam after 25 years of operation. The plant will play an important role in supplying power to the country’s southern part as there have been delays in the implementation of the Song Hau 1 and Long Phu 1 thermal power projects. Vinh Tan 1 is expected to generate more than 7.2 billion kWh of electricity per year, increasing the southern region’s electricity supply capacity and helping reduce its dependence on hydropower, especially in the dry season or during droughts.